We begin this issue of BJI with an excellent report by JPB that summarizes the double-deck playing conditions in the casinos located on the Las Vegas Strip. We've analyzed and written about how Don Johnson won millions from Atlantic City casinos by taking advantage of their loss-rebate programs (BJI issues #138 and #139). This month, Eliot Jacobson will present his analysis of Johnson's coup and the man himself. We've got detailed reports on blackjack playing conditions from three casinos in Las Vegas ( Rampart, Suncoast, and Red Rock by Stu D. Hoss), several casinos located in North Lake Tahoe (by KC Brooks), and all the Atlantic City casinos (by Frank Scoblete, including his speculation of where all the card counting teams have gone). Dan Pronovost explains how you can use software programs as training tools to help you become a better player. John Grochowski answers questions about the procedures that casinos use when dealers make a "dealing" mistake, the house edge on different video roulette games, and the best way to use your free play (excellent advice, which I use when I accummulate free play from playing video poker). Speaking of video poker, if you want learn about variance and how it affects your play, read my article. Last, but not least, we have a summary of major blackjack tournaments across the U.S., courtesy of blackjacktournaments.com. 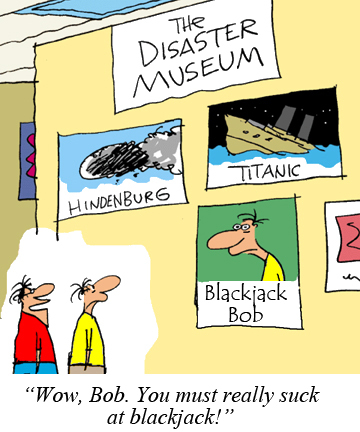 Note: Send us your feedback on playing conditions (good and bad) that you observe when you play blackjack and we'll publish them in the BJI in our new Reader's Feedback on Playing Conditions section. Send to: HTamburin@aol.com. 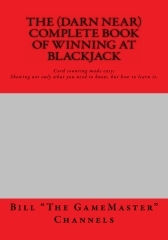 THE (DARN) NEAR COMPLETE BOOK AT WINNING AT BLACKJACK by Bill "The GameMaster" Channels. The excellent book makes learning card counting easy, showing you not only what you need to learn, but also how to learn it. Click here for more information about the book and/or to order it at a special discounted price. Trust me, you won't be disappointed with it's content. This article, which appeared in issue #66 of BJI, summarized the results of the famous court case in which a jury found Griffin Investigations guilty of maliciously libeling two professional gamblers, Mike Russo and James Grosjean. If you are not familiar with this famous court case, take a minute and read what the outcome was. E-mail subscribers can also read each month's issue online at our web site: BJI Issue #161, June 2013. "If you are a serious card counter trying to log many playing hours in Vegas, do as I say not as I did. On this trip, I decided ahead of time that I was going to play double-deck games exclusively and live with the consequences..."
DON JOHNSON: THE MASTER SPEAKS-PART 1 by Eliot Jacobson, Ph.D.
"Last Tuesday, I heard Don Johnson (DJ) speak at the World Game Protection Conference in Las Vegas. In case you don't know who he is, DJ is the guy who beat several Atlantic City casinos out of over 15 million dollars in late 2011 and early 2012 by exploiting their loss-rebate programs. This is what he said..."
"For those that aren't familiar, The Howard Hughes Corporation developed the community known as Summerlin, located on the west side of the Las Vegas metropolitan area... In the midst of Summerlin's golf courses, gated communities, mountain shadows, and open spaces lay three casinos - Rampart, Suncoast, and Red Rock. Behind their collective doors is some pretty good blackjack..."
"The drive from Reno to North Shore Lake Tahoe is slightly over an hour. The views are incredible; from the snowcapped mountains to the brilliant blue hue of Lake Tahoe, you would be hard-pressed to find a more picturesque landscape. From the Mt. Rose summit, you drop into Incline Village, make a right turn at highway 28, and travel a few miles to the California and Nevada border at Crystal Bay. There you will find The Crystal Bay Club, Tahoe Biltmore, and Jim Kelly's Nugget Casino..."
"An update on playing conditions in all the Atlantic City casinos, and Scoblete's speculation on where all the blackjack card counting teams have gone..."
"Think back� to that first time you stepped into a casino, and plunked down that initial blackjack bet, craps wager, or video poker spin. Did you make the right plays, or did you suffer the stares and rolling eyes of the experienced players around you..."
"Grochowski answers questions dealing with procedural mistakes made by a dealer and its resolution by a pit supervisor, the odds on video roulette games, and the best way to play your free play..."
"Astute video poker players know that the best games to play are those that have an ER close to, or slightly over, 100%, using perfect playing strategy. However, there is another characteristic of video poker games that is not so well known but just as important, and that's volatility..."